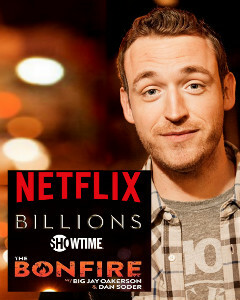 Originally from Aurora, CO, Dan Soder started doing standup at 21 while attending the University of Arizona. After two years of playing clubs and casinos all over the southwest, Dan decided he’d had enough of extreme heat and venomous animals, so he moved to New York to get serious about stand-up. After living in New York for close to 5 years, he had been featured on Comedy Central’s “Live at Gotham”, and was the standout at the 2011 Montreal Just For Laughs Comedy Festival. Dan was also voted funniest comedian at the New York Comedy Festival. He is currently best known as ‘Mafee’ on the hit Showtime Billions series. He has a new Half Hour Special on Netflix’s “The Standups”. His first hour-long stand-up special, Not Special premiered last year on Comedy Central. Other credits include: Comedy Central’s Half Hour, Conan, Inside Amy Schumer, and @midnight. Dan also hosts Sirius XM’s The Bonfire with Big Jay Oakerson, Monday – Thursday at 6pm ET.